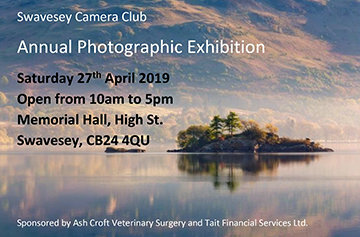 With our Annual Spring Exhibition now an established event in the Swavesey year, this is our opportunity to demonstrate our skills to the public. Participation by all is encouraged and in addition to the prints, there will be a continuous show of projected images and AV shows, while greetings cards will be on sale, with proceeds going to Arthur Rank Hospice. As in previous years we host an Open Photographic Competition within our Annual exhibition. Our aim is to encourage photography amongst everyone in the local community. This is open to non-professionals and can be any subject in three categories; junior school age, senior school age and adults. Prizes for the group winners. More details can be found here. Kindly sponsored by Ash Croft Veterinary Surgery and Tait Financial Services Ltd.